​Do you know a volunteer who goes "above and beyond" for our kids at Woodridge? Each year the Woodridge Elementary PSTA presents a Golden Acorn Award to volunteers who have given exemplary volunteer service to children and youth in our school community. The recipients of this award are volunteers who promote the mission of the PTA: to be a "powerful voice for all children, a relevant source for families and communities, and a strong advocate for the well-being and education of each child. Nominations are being accepted for volunteers in every grade level until June 16th. If you know of someone deserving of this award, please complete the nomination form below or email president@woodridgeptsa.org with the nominee's name and why they should be nominated no later than June 16th. 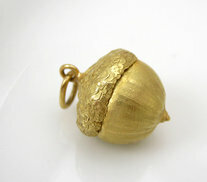 Golden Acorn winners will be announced the week of June 19th and awarded a pin and certificate. Thank you for taking the time to acknowledge our wonderful volunteers!